Spectacular New View Home Located on a Sunny Corner Lot on a private dead end street in popular North Beach. You will love the modern open concept floor plan sporting Puget Sound views from almost every room. The main floor offers a large covered deck with a warm gas fireplace as well as peaceful view of the Puget Sound. All the bedrooms are spacious with walk-in closets including an oversized Master Suite with A 2nd covered deck. The Private Guest Suite downstairs sports a full bath. You will also find a nice family Room on this level. This might be a perfect space for inlaws, a nanny or an airbnb space. A Perfect Blend Of Hardwoods, Tiles, Glass And Metal. Huge Two Plus Car Garage With Adjacent Work Shop. Roof Top Deck. This Home Has It All. property in beach club rights area. 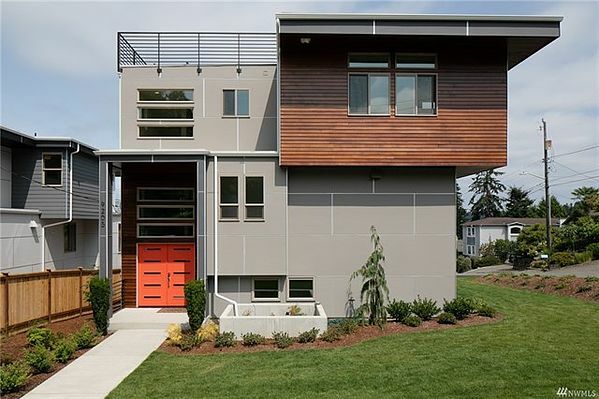 If you are looking for a change in address or a change in lifestyle, look no further than this beautiful North Beach Modern. Call the buyer broker, Michael Peters for additional information at #206-856-5500. Of email me (mpeters@sellingseattle.com) to get put on my email list for the dozens of new homes coming on the market in the next 6 months. "it is smart to plan ahead"!